No superhero rpg history list this week; they'll return in two weeks. 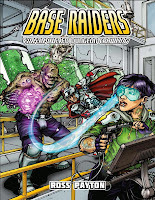 Today I offer a review of a great new supers rpg, Base Raiders. The Hulk dropped a mountain on them in one campaign. In another they’d aged out and died or been quietly eliminated by the government. In one campaign their enemies had run the world for generations, killing them off before they could become public. Another began with a titanic clash between the two sides at a secret prison complex. My favorite combined natural disasters and supernatural invasion to vastly reduce their population. Killing off heroes is a way of life for supers campaigns. For some GMs that provides a way to clear the decks and give the players room to operate. It puts the focus and responsibility on the PCs. It can also be a way to deal with a campaign world with extensive history and rich backstory. Instead of inviting buy-in, that detail can instead encourage player opt out. This cuts across campaign genres. Consider the Wrath of the Immortals in Mystara and the Sundering in the Forgotten Realms. Ross Payton’s Base Raiders is a complete Fate-based superhero game which begins with this premise. The world has a rich and diverse history of super-powers. Think of Astro City or all of the weirdness present in either of the Big Two universes. Anything went from alien invasions to Atlantaen mindworms to replicant robots to masked vigilantes to demon lords. But that’s over now- as all of the potent and powerful supers of any stripe vanished in a mysterious incident they call Ragnarok. That’s a solid premise, but Base Raiders takes it further. It adds questions of government paranoia, fame seeking, and a sense of collapse. Most importantly focuses core play on the base raiding of the title. When those heroes, villains, and other weird beings vanished, they left behind bases- in some cases dozens of them. These marvels contain secrets, materials to scavenge, hi-tech toys, and the possibility of new powers. The PCs are supers- or at least have heightened abilities. They’ve joined together to raid these bases for various reasons- finding a lost loved one, shutting down a danger, discovering a cure, locating a source for new magics, finding vast quantities of filthy loot. They have to fight past traps, failed experiments, and sentient guardians of all shapes and sizes. But they must do this quietly for fear of alerting the authorities or competitors. Base Raiders is “Super-Powered Dungeon Crawling” as given in the subtitle, but that’s not all it is. Ross Payton sent me a pdf of Base Raiders as a review copy. After spending about fifteen minutes with it, I went online to buy a printed copy. I wanted a physical copy to flip through and mark up. I have more pdfs than physical books these days, but I haven’t made the transition fully. When I hit something with as many cool ideas and concepts as Base Raiders, I need to work through it fully. Does the game stand up to that thorough read-through? I’m tackling this review a little differently. Usually I offer an overview and walk through the sections in order. This time I want to split things into three areas: what it looks like, how the system works, and what the setting’s like. Base Raiders isn’t a small supplement, with 260 standard-size pages. It offers a complete game with both mechanics and setting well presented. The layout’s cleanly and simply done. It has a nice balance of white space and you can get through the text easily. It’s a few minor tweaks away from being excellent. The illustrations range across the spectrum. You have a few highly detailed pieces, some nice consistent character illustrations, and then some lazier and more cartoony art. The cover’s a little busy but it conveys the game’s piece. The Fallout-style advert pieces sells the idea of a super organization offering Vault-like base construction. Base Raiders does have a couple of small presentation problems. Some columns break oddly across pages. That happens in some key reference spaces which is why I noticed. That rarely interfered with my ability to get the rules. Overall it works. 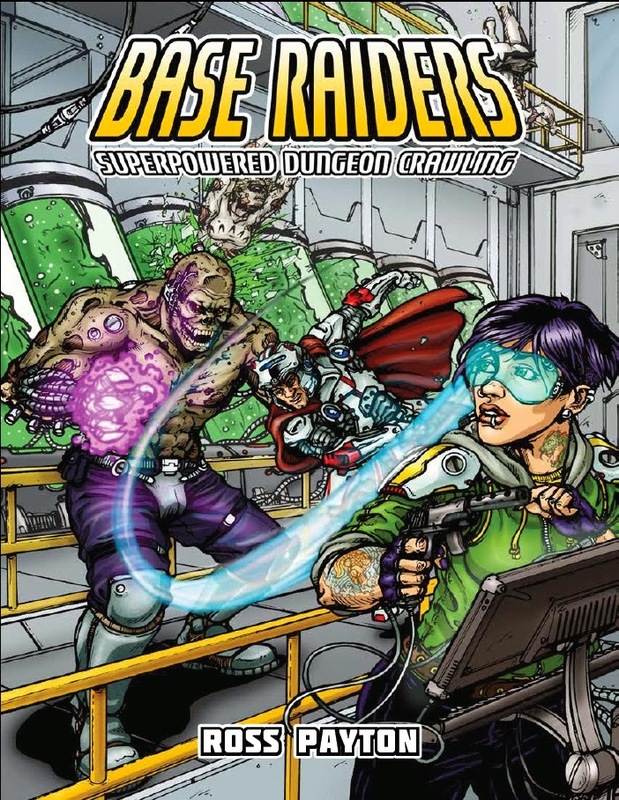 Base Raiders uses the version of Fate, Strange Fate, created for Kerberos Club (reviewed here). This pre-dates Fate Core and so offers a more complicated architecture. It feels more like Legends of Angelerre, The Dresden Files, or even Stands of Fate. It still isn’t a complex system by any means, but it does have a lot of moving parts and a more involved power/skill construction system. I’m guessing most readers know Fate- a set of system mechanics which have gone through several versions. Designers have used the basic engine for many versions, including universal game. Fate has a simple resolution system with a roll + skill versus a target number. The roll runs from -4 to +4 or -5 to +5 depending on the dice used, with a significant bell curve at zero. Margin of success generally adds to effect. Aspects are Fate’s other significant element. Aspects represent qualities on persons, places, or things. It allows for quick descriptions with mechanical effects. Aspects can be invoked, often by using the limited resource of Fate points, to gain a reroll, bonus, or to create an effect in a scene. Fate veterans will find a game that sticks pretty closely to the basic concepts. PCs can have a large number of aspects- some of them tied to their powers. Assessments, Declarations, and Maneuvers all have slightly different rules. Stress “rolls up” to the next available box. Shifts cause effects, but there’s no spin rules. The system drops Stunts in favor of the powers and extras rules. Base Raiders keeps the key elements intact and extends on them with several new concepts. The most significant of these is the handling of powers. These can be represented by Unique or Strange skills. For the most part these are the same, but the latter covers actual powers. To use them a character must have a source of powers and each Strange skill must also have a drawback. Unique skills can represent training or background (like Underworld Networking or Dark Knight Vigilante). Basically players create Unique and Strange skills by assembling a set of trappings for the skill. Trappings represent the most basic uses for skills. Even common skills are defined by these trappings. For example the basic Melee Weapons skill includes Strike, Strike + Range, Parry, and Information. Burglary includes Examine, Security, and Information. Players used to Fate Core’s more universal approach to skills may find this too granular. To assemble a skill package, players use the skill trappings chart. Related trappings cost less to add and the system’s smartly done and balanced. Drawbacks and extras can be used to reduce the point cost. At the cost of reducing the character’s Fate Point refresh, these skills can be raised in Tier which increases the effectiveness. That’s the element perhaps most problematic in Base Raider’s particular flavor of Fate. Power Tiers change the dice mechanic in play. A character using an Extraordinary Tier power against a Mundane Tier defense rolls three Fate dice plus 1d6. A greater shift, say Superhuman against Mundane, means more dice shifted. That dramatically changes the game. On the one hand it does simulate the difference between superbeings and humanity. On the other it creates a kind of arms race. Characters without a single high tier offense and defense skill will find themselves outclassed quickly. In play it creates weird situations and imbalances. I’ve run several times with this dice mechanic and Fate- both with Base Raiders and with a Scion hack. Players either disliked or merely tolerated the system both times. I spoke to several of the players to get their sense of things. In particular the veteran Fate player in the Base Raiders game thought that the idea was interesting but swung things too wildly. He suggested a 1d3 or 1d4 might work better. I haven’t tried that solution. I don’t think the game’s broken- clearly Ross Payton and others have gotten workable and successful campaigns out of it. The mechanic made sense in Kerberos Club; it offers weirdly unbalanced PCs who are dangerous to even be near. I’m less certain of it here. Beyond that Base Raiders offers several interesting mechanics which could easily be borrowed for other Fate games. It includes Strange Fate’s system for handling collateral damage (a must for a supers game). Some tiers of trappings add interesting new effects. Players pick Archetype and Backgrounds which provide examples as well as aspect slots. Character and team goals have an impact on mechanics and advancement. Some of the most interesting sub-systems cover power interactions and base building. 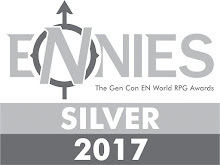 The latter especially offers ideas on how players and the GM can collaboratively craft a new base and plot hooks for the group. There’s a “loot” system which encourage players to scavenge from the bases they raid in order to convert them into usable resources. The background, GM material, and sample base make up a little over half of the book. It might seem overkill to spend so many pages describing a world only to tear it down, but it really works. The complexity and crazy detail forms the wreckage out of which this new superhero world will be built. It offers an interesting new take on balance in such a world and what happens when that’s completely toppled. GMs and players will find great material to forge exciting plots and interesting characters. Any superhero gamer ought to read this. The Build-a-Base concept, how supers organized, the underground black markets, organized crime’s response- Base Raiders has many flashes of brilliance. Two themes run through the rules: the bases of the title and the idea of self-advancement. The setting offers a logical reason why so many bases would exist. In some ways it’s more logical than a fantasy world filled with dungeons. Superbeings with access to nano-contruction devices went wild crafting labs, prisons, fortresses, and sanctums. And they didn’t stop with a single facility. The central idea- going into a super base can be done as a classic dungeon-crawl- works really well. The book describes many kinds of bases and offers great ideas for the how and why of that. Black marketeers and the Underground offer PC Base Raiders has the right mix of tension and support. Raid plots may involve tracking down, researching, and preparing for a raid. The public has an insatiable curiosity about these secret bases, rival factions want the power which can come from them, and the authorities want to stop anyone from entering. The PCs themselves may have many different reasons for breaking in. That leads to the second theme, the potential power which bases may offer. The heroes and villains who vanished represented the most dangerous and powerful beings on the planet. Those remains…not so much. Many civilians (and potentially many PCs) have begun to hunt for get-superpowers-quick schemes. From super-soldier formulas to ancient scrolls to untested armor suits there’s a mania for becoming one of the lucky and chosen. Imagine the power of the internet harnessed to this kind of obsession. It makes for an interesting contrast between characters driven by this hunt and those with more altruistic needs (finding out the secret of Ragnarok, discovering a cure for a loved one, finding answers about one’s own origin). That’s a great and playable set of concepts. Ross Payton brings these ideas together well. While the game pitches itself as a dungeon-crawler, it doesn’t have to be just that. In fact that hook overshadows some of the other ideas present. A typical dungeon-based game would have more in the way of “magic-items,” monsters, and location dressing. Base Raiders focuses as much on the broader picture. Base raiding could easily be used as the starter for a longer, more conventional superhero campaign. The PCs gather together for just a job and instead bond as a group. They learn secrets in their first few runs, gain new powers, and eventually expand their horizons. They can become the new paragons in this post-collapse world. The presence of the bases then offers a ready supply of future villains to fight. I could easily imagine running a pick up campaign from that starting point. The example base may be the only weak point of the material. And even that’s more about what my expectations than the write-up itself. Payton provides an interesting and dangerous setting in The Zombie Factory (spoilers: see cover). The five-level dungeon comes complete with maps, traps, and a dangerous set of foes at the lowest level. There’s discussion of how to tweak the material and it feels like a useful toolkit. But it doesn’t seem to work as well as a demo module for a couple of reasons. First the set up assumes that the players come to the base via a teleporter from another base they’ve already raided. That detail’s key to the layout and trap of the setting. So you either have to handwave that or come up with another base for the group to go through first. Second the base has a semi-omnipotent defense AI who essentially blackmails the PCs into carrying out its wishes. That’s not a great way to start things out. Both times I ran the scenario I made major modification to remove those issues. The Zombie Factory’s a great base, but works better as a later campaign element. I’d like to see a demo module which stresses the cool aspects of base raiding and perhaps even the heroic elements. The players have to get into a base to stop something bad from happening. At the same time another group has also broken in. I’d like to hook the players with the fun and dungeon-crawly bits of the setting before bringing the hammer down. The book could also use some simple and balanced pre-gen characters representing archetypes. The example characters given vary in power level and a few have weirdly open power sets. That means GMs will have to tweak them to make a good team. I really love Base Raiders conceptually. The world’s smart, interesting, and well presented. I’m a fan of superhero rpgs and I’ve been assembling my history lists of the genre. That means I’ve gone through many setting sourcebooks from default classic worlds of big ticket games to the smaller and edgier backgrounds niche smaller presses offer. If I’m lucky, I’ll find a character concept or plot I want to lift. Base Raiders presents one of the few supers settings I’d want to play out wholesale. Each chapter offers multiple new ideas. This is one of the most interesting and game-inspiring superhero rpgs I’ve read in a long time. But I’m probably not going to use the system. I might tweak it or adapt some of the elements for our house homebrew. 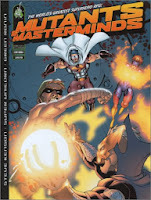 The introduction indicates that conversion guidelines for Savage Worlds, Mutants & Masterminds, and Wild Talents will be available on the website by the end of 2013. I’m really looking forward to those. I’d love to see stronger demo module and some balanced pre-gen characters for play. Beyond that this setting demands another sourcebook offering even more material and ideas. For example, Payton could assemble a set of generators for random base creation. 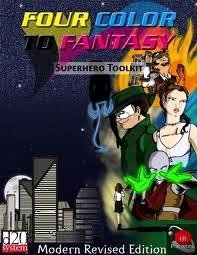 Imagine something like Frog God Games’ awesome Tome of Adventure Design, but tuned to superheroes. Who should buy this? Anyone interested in superhero games- regardless of system. GMs will find much to love here. The material here could at the very least offer a great new set of plots and arcs for any supers campaign. I’d also recommend this to Fate hackers. Payton plays with the Strange Fate system and adds some interesting new tweaks and sub-systems. It isn’t Fate Core, but if you like playing around with the nuts and bolts of the system, you will find some cool ideas here. It moves away from a streamlined stunt & aspect approach I’ve seen people online present or even the shopping list structure of Icons. Finally anyone who enjoys novel world-building in an rpg book. I’ve posted a couple of Actual Play sessions of Base Raiders. Both use a heavily modified version of the base given in the book. This one has video and audio and uses the Base Raiders system as is. This one is audio only and uses a version of Base Raiders adapted to our homebrew Action Cards system. Over the past couple of years Art Lyon and I have been working on several new pitches. Collaborating with Art has been a pleasure. We've developed some interesting concepts and gone down some blind alleys. We spent some time thinking what might work for DC's nu52 universe. We decided to play around with Warlord, a character who fits with our shared love of pulp fantasy and swords & sorcery. The pitch itself didn't get anywhere, but I thought people might enjoy taking a look at it. I may steal the premise for a campaign. 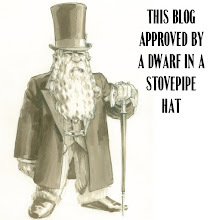 In particular we owe a debt to Trey Causey and his blog From the Sorcerer's Skull. 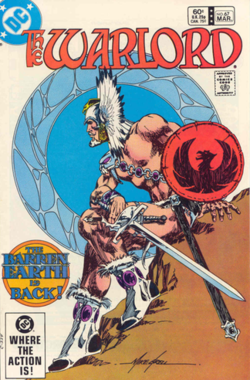 His "Warlord Wednesday" series is a must read for fans of the character. We wrote several versions of the pitch (full plot synopsis, character profiles, one-page). Below is the draft of a mid-sized version. Warlord re-imagined, fusing that classic character's action roots with fresh approaches from modern fantasy (Final Fantasy, The Hunger Games, Bleach). Travis Morgan gains allies and enemies as he battles across the hollow world of Skartaris to save a land he endangered and a woman he loves from the apocalyptic schemes of an ancient tyrant reborn. Too restless to find a place in the modern world, Travis Morgan crashes into the "hollow world" of Skartaris after a rescue turns into a fight for survival. Seeking revenge, he pursues Deimos, an avatar of ancient powers battling over this realm. Once a lone wolf, Morgan must gather a team with their own grudges against the sorcerer. He’ll need to understand this world and himself if he has any hope of victory—a victory that may force a choice between this new world and the woman he loves. Travis Morgan: Self-confident, adventurous, independent—and alone. He turned his back on the past to live in the wild, but fierce loyalty and love pull him back. Now he faces a perilous world where to survive he must confront not only great evil but his own failings. Lethe Daniels: A visionary biotechnologist who shares a tumultuous past with Morgan. At a remote Antarctic research station, her startling discovery puts two worlds in jeopardy. Maddox: This by-the-book security officer was once Morgan’s best friend until Maddox’ 'mission over morals' attitude put them at odds; his resentment, secret orders, and infatuation with Daniels escalate the conflict that catapults them into Skartaris. Deimos: Dark sorcerer from Skartaris' ancient past, unwittingly resurrected by the merging of arcane magicks and Earthly genetics—a science Daniels knows and Deimos needs to remake Skartaris in his own lightless image...but is he just a facet of an even greater threat? Shakira: Half-wild shape-changer; her fighting prowess and insights into Skartaris make her an invaluable ally. She guards her own secrets closely, at the risk of endangering Skartaris. Tara: Seer and guardian of the golden city of Shamballah, exemplar of civilized Skartaris. Visions of Shamballah's destruction—and Morgan's role in it—thrust her out of a pre-ordained life and headlong onto a perilous path alongside Morgan's own. Machiste: Warrior-lord of Kiro, he offered himself to his people's greatest enemy to save them from destruction. Rescued by Morgan but kept from his home by a Relic's curse, he joins Morgan's quest to bring down Deimos, hoping to end his bane and regain his crown. The Relics: Constructed by the Ancients for purposes lost in the passing of ages, but whose powers and dominions are crucial to the survival of all life in Skartaris. Skartaris: A pocket-universe “hollow world” lit by a constant noon-day sun. A foreboding moon orbits the sun and beneath it a crawling zone of darkness follows, the key to unlocking dark powers. Skartaris is a tableau of strange regions and cultures, from the primeval to the medieval and the brutish to the mystical. Arcane sorceries and multifarious conspiracies swirl in courts and covens. Living Relics—from the vast to the minuscule—litter Skartaris, fragments of their mysterious creators. All this—as well as steaming jungles, towering peaks, roaring oceans, and every manner of fantastic beast—presents deadly challenges at every turn. Despite turning his back on civilization, a desperate call from former lover LETHE DANIELS sends ex-military freelancer TRAVIS MORGAN to a remote polar research station. In the facility—besieged by strange energies and fantastic creatures—Morgan encounters MADDOX, the security chief. A former friend infatuated with Daniels, Maddox resents Morgan, and points out the costs of his past recklessness. The pair fight the invaders and each other as they strike toward the barricaded main lab. They smash through to find the possessed researchers—including Daniels—chanting a single word: Deimos. Before them writhes the fruit of their labor: part plant, part animal, part construct. Morgan frees Daniels, but the conflicts come to a head. Following secret orders Maddox accidentally activates the device. Gravity shifts and the building warps. Morgan crawls from the wreckage to find they have arrived in the hollow world of Skartaris. Just as they gain their bearings, serpent-riding huntsmen set upon them. Morgan leads the survivors into the jungle, and then sacrifices himself as a distraction. The lead hunters overwhelm him, but the sudden appearance of a massive black panther turns the tables. When it transforms into the warrior SHAKIRA Morgan convinces her to aid them. Daniels' trail leads to a lost temple cavern where they arrive just ahead of the hunters. There Morgan's blood miraculously opens a cache of empowered armor and weapons, but the battle still goes against them. Amidst the fighting, Maddox seemingly kills Daniels as his body transforms. He tries to kill himself to stop the possession, but a furious Morgan prevents him. Maddox is consumed, and in his place stands the twisted form of the sorcerer DEIMOS. He thanks Morgan and summons magical flames. Shakira tackles Morgan, hurtling them off a cliff. To outrace Deimos they push through the sorcerer's conquered lands. Morgan now sees the death and decay his enemy has wrought. When a rampaging war colossus blocks their path, Morgan rushes to stop it, and finds MACHISTE attempting to do the same. Together they succeed, and the warrior-prince joins our heroes in their quest. They stage a break out from the slave pens of Golgoloth where Deimos' War Apes hold future sacrifices. To convince a freed mercenary mage, Tara reveals herself by calling a vision of Deimos—and a still-living Daniels. A shaken Morgan knows his desires will now clash with those of his allies. Morgan has faced some of his own demons, and now he must find his place in this new world. He's quickly thrown into the complex maneuvering of Shamballah's nobility. Fighting his impulse to head off on his own, Morgan must learn to build friendships, and most importantly to trust those friends. At the same time, Morgan begins to learn about the sentient Relics of Skartaris—and that Deimos was one of these. Some of the relics appear benevolent, but Morgan suspects darker truths. This show takes a slightly different approach to that question. It might be better put “How Can We Get Better at Being GMs?” We begin by identifying areas where we feel weak, have stumbled in the past, or could use improvement. That’s a tough question and requires an admission of weakness. I don’t know about my co-hosts, but I can be particularly defensive about how I GM. I’ve spent years doing it and I think I’ve developed into a consistently enjoyable gamemaster. But I also thought that in the past- and looking back I can see the wreckage of terrible decisions and awful games. I’m probably harsher on those campaigns than I ought to be. But I see where I could have done a better job and made the experience more enjoyable for everyone. Now I want to objectively assess what I do…which is freaking hard. Play groups add another dimension to this. Right now I have five campaigns ongoing, just finished, or about to restart. Those have sixteen unique players- with several of them repeated across campaigns. That’s still a pretty small sample size. They’re mostly used to how I run. Do my techniques work with other groups? I’ve run a small number of online one-shots and I think they went well. But honestly I can’t come to a clear judgment about that. I haven’t yet gone back to watch any of those YouTube videos so I should probably start there. I also need to run more pick-up one-shots to test my style. Have I cowed my players into submission, am I running a fun game, or something in between? Each of these podcasts we give GM advice despite our flaws and limitations. It is advice- things or ideas we found interesting, novel, or useful. But I don’t think any of our statements should be taken as “you’re supposed to do it this way.” I’d find it hard to make any kind of absolute pronouncement about how anyone should run. I can only address what’s worked (or not worked) for me or in other people’s games I've seen. As an example, I mentioned some advice from Kazuo Koike at the end of our episode on Developing Story. He suggests beginning with your Villain when figuring out your tale. I mentioned that as an interesting starting point for stuck GMs. Does that mean I think every game should have a villain? No. That depends on your group and play style. But if you’re trying to come up with something, that’s a neat way to think about things and it might help you spin out some fun sessions. It plays into my larger point: characters drive stories for me. That can be PCs, interesting NPCs or even grand villains. Other GMs might focus more on plot or environment. Of course I dig my own advice, so I’m a little attached to it. When people suggest very different approaches, my immediate reaction is “But…but…”. I’ve had to learn to simmer down- you can’t survive reacting that way and reading gaming posts on RPG Geek or G+. You’ll have an aneurysm. If someone presents a GM-focused and plotted approach to running a campaign, that’s not a dismissal of my occasional uses of collaborative campaign design. They’re saying what’s worked for them, not attacking what’s worked for me. Consider how niche our hobby is: its frankly amazing and awesome that we have so many distinct approaches. All of which is to say I hope you find some gems in our discussion and I recognize you have to sift through coal to get there. I sincerely hope everyone has a great holiday season and manages to squeeze in some good games. Tonight I run what promises to be the last session of a nearly eight-year long campaign and frankly I’m terrified. If you like RPG Gaming podcasts, I hope you'll check out Play on Target. We take a focused approach- tackling a single topic each episode. You can subscribe to the show on iTunes or follow the podcast's page at www.playontarget.com. In the last two posts I described how I see superhero stories divided: Sci-Fi, Pulp, and Mythic. I suspect that last category, Mythic, includes more actual gaming than the other two combined. Yet it may be what gives some gamers as bad taste when they think of supers games. Mythic games can be powerful- at the very least they embrace the idea of powers. They eschew realism in favor of spectacle and cool. That has several consequences, including the hand-waving of repercussions. A battle between titans in an urban metropolis has serious and specific consequences in a Sci-Fi supers game. The decay of infrastructure, shifts in the economy, poisonous fallout. In a Pulp game it focuses on drama: the revelation of the destruction, loss of friends, reactions of horror from the general populace. In a Mythic game someone cleans up afterwards- perhaps with a small comment about rebuilding. Or the horrific destruction gets downplayed (ala Man of Steel). More rarely Mythic stories embrace that catastrophe as a message and a metaphor (ala Kid Miracleman’s assault on London or the Batman NML arc). That leads to the next part of Mythic: symbolism. Mythic stories rely on archetypes. Characters stand for ideas and beliefs. Heroes might embrace those for a purpose, but those eventually come to define them. Some writers make a more explicit connection to mythology. Consider Grant Morrison’s JLA run or Seven Soldiers mini-series; Mark Waid’s Kingdom Come; and Alan Moore’s Promethea. All of these make heroes into figures in stories that echo Beowulf, Gilgamesh, and Ovid’s Metamorphosis. Kirby and Starlin represent the greatest of these Mythic storytellers- from Thor to the New Gods to Warlock and so on. They brought the cosmic. That leads to worlds where magic, psychic powers, mutations, alien hybrids, and intelligent robots all exist side by side. And they exist without any attempt to rationalize and explain away how that’s actually happening. The Asgardians aren’t super-aliens- they’re gods. All powers don’t actually derive from a super-virus or a multi-dimensional rift in the Bleed. They’re crazy, mixed up and wild. Anything goes and that’s a double-edged sword. Creators, GMs, and players have all the room they want. But that can feel unreal, unmoored from any connection to the human condition. It can result in power fantasy campaigns and stories without and depth. Events: Oddly Marvel’s Infinity Abyss and DC’s Joker: Last Laugh seem to be the only big ones in this period. Television: Power Rangers Wild Force, Teamo Supremo, ¡Mucha Lucha!, Ultraman Tiga, Ultimate Muscle, Teenage Mutant Ninja Turtles, Power Rangers: Ninja Storm, Venture Brothers, Spider Man New Animated Series, Teen Titans, Xiaolin Showdown, Jake 2.0. Films: Blade II, Spider Man, Daredevil, X-2: X-Men United, Hulk, The League of Extraordinary Gentlemen. These lists cover a smaller slice of time than my past rpg lists. I hope this makes them easier to read. I include mostly core books, but also significant setting or sourcebooks. I list revised editions which significantly changed a line. Generally I only include published material- print or electronic. I leave out freebie or self-published games. I'm sure I've left something off without adequate reason; feel free to add a comment about a line I missed (if published from 2002-2003). I've arranged these in by year and then alphabetically within that year. Hero System 5 broke me. I felt alienated by gaming's new emphasis on shifts and edition revisions. I'd gone along with Rolemaster's changes, but reworkings and new key system supplements finally wore me out. Over the next couple of years I dropped three systems we played for well over a decade in our groups: Rolemaster, GURPS, and Champions. Fatigue and expense killed those off. Instead for the moment I stuck with Hero 4th Edition- it worked fine. Or so I thought. I tried teaching it to some new players. They disliked it and my own desire for lighter rules didn't help matters. That being said Hero 5e is a beast- an impressive clean-up and consolidation of the rules. You can see more about that in this RPG Geek "Share a Game Thread" and in even more detail at Ross Watson's post on the changes. Hero 5 was a huge tome and the revised version only increased its bullet-stopping size. More importantly the fifth edition generated an incredibly solid set of sub-lines (Champions, Dark Champions, Fantasy Hero, Star Hero). Each of those in turn had amazing support and great products. The product line for Champions 5 is probably the best single line of superhero supplements out there. Each covers their topics in depth, offers many new NPCs, and has a complementary Hero Designer electronic edition. The line includes my single favorite supers supplement- Villainy Amok. If you're looking inspirational products for a superhero game, start by checking out Champions 5. Point buy. d6 Resolution. 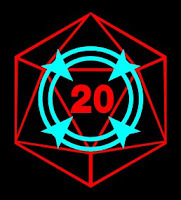 A set of rules for adapting d20 to superhero games. Offers a point-buy system for choosing powers. The game itself sticks fairly close to the original d20 material, with classes to define characters. Across the board it adds elements to emulate the genre, but tries to keep the system close to original D&D 3.0 version. In 2003 Crytosnark released an enlarged and revised 1.1 version of the rules. That version has 374 trade-sized pages, so not a small product. Deeds Not Words contains a number of interesting options. Superpowers take up about 100 pages. That's complemented by sections on Power Armor, Psionics, Mystic Skills, Super-Science, and even Super-Pets. If you like original d20, this may be the super-game for you. The layout and art's serviceable. 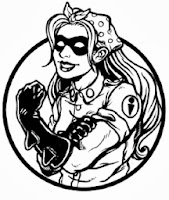 Cryptosnark published two supplements for it: Laying the Smack Down!- with new combat options- and Bold Costumes, Black Hearts- a villain sourcebook. Level and class based. Various dice. Subtitled "Superhero Toolkit." 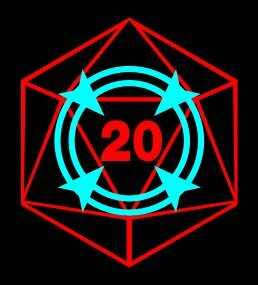 Four Color to Fantasy offers a superhero skin for the d20 mechanics. While the cover makes it look amateurish, the interior layout and design's quite good. The designers organize the material clearly. FCtF assumes players bring significant d20 knowledge and lays out the key additions to that early on. Rather than distinct classes for archetypes, it has one class which offers powers, The Hero. Four prestige classes allow some additional focus, but the rules give freedom to the players. To make things easier the game also offers some templates of common power configurations. Had EN Publishing done more with the line we probably would have seen supplements with additional templates. The rules include both powers and super-feats, but there's no hard rule about what falls into one versus the other. Those still working with d20 3.0 may find some useful ideas here. Four Color to Fantasy includes a supers setting called “Dark Decade.” It presents a 1980's New York City with a supernatural subculture (ala World of Darkness). The superhero PCs battle against those monsters. It isn't a bad idea and would be worth seeing developed and expanded as a sourcebook. There's not nearly enough room to develop the concepts here. In 2003 EN Publishing released a revised version. Oddly though there's a link for it, RPGNow no longer has that product listed- just the earlier version. Level based. Point buy. Various dice. A really lovely little game and sourcebook I regret not picking up when it came out. I've knocked Steve Jackson Games in the past for odd licensing choices (GURPS Planet Krishna). Hellboy's a dynamite choice. It combines action, horror, and strange powers. The game also came out a couple of years before the first film, so it had that combined with a successful comic book line. 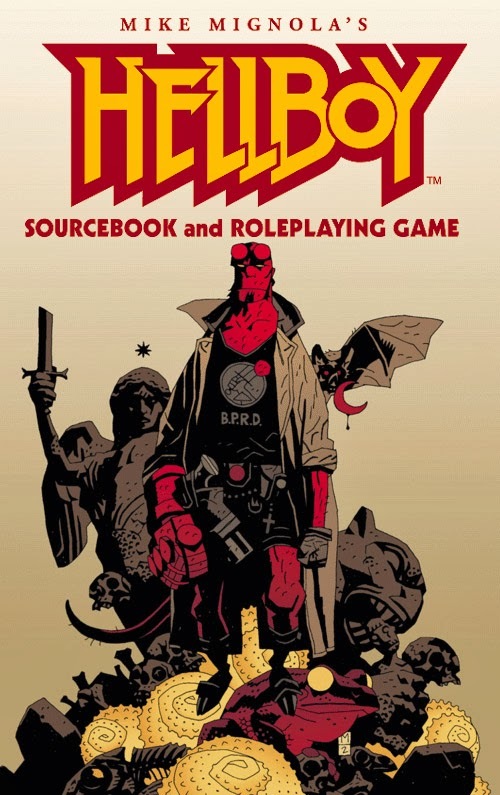 While Hellboy's both a sourcebook and an rpg, the book entangles the rules with the sourcebook material more than other similar products. That works against it more than a little. Readers looking for extensive background on the series may be put off by the stats and numbers everywhere. They have to read around the game. GURPS Lite powers the rules. I mentioned before my dislike of GURPS’ approach to Supers. I know some gamers generated great campaigns with it, but I disliked its clunkiness. Hellboy covers a much narrower set of powers and abilities. It has interesting options, including ritual paths and psychic powers. GURPS supplements and sub-systems work when they operate in a narrower and better defined range. Hellboy doesn't have to cover everything. I'm unsure how well it did for SJG. It arrived just before they transitioned to GURPS 4e which I expect drew attention away from it. You can still find copies online for a decent price. Point-based. d6 resolution. 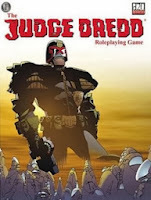 The second of the three (so far) Judge Dredd rpgs. Mongoose's first whack at the setting uses d20. Unlike some d20 adaptations you need a copy of the Players Handbook to play. Players choose between Street Judges, Psi-Judges, and Citizens for class. The last choice seems to be on offer if a group wants to play a criminal game set in Mega-City One. If someone pitched me on a Dredd game where we didn't play judges, but instead the people who get killed by Judges I'm pretty sure I'd less-than-politely decline. As you can imagine there's a plethora of new feats, crunchy combat options, and lots of equipment from robots to guns. The line did well enough for Mongoose to publish many supplements, the majority in the Rookie's Guide series. They released the last books in the series in 2004; several years later they came back with a version based on Traveller. I've hit game fatigue. It happens when I work on these history lists. Many products offer unique and distinctive takes on the genre. They have a pitch and a striking concept—and they lead with that. It might not always be great, but they make it so I can grok the idea from the back cover, tagline, and/or publisher blurb. But I'm worn down by games that won't or can't distinguish themselves. Supers games in particular suffer from this. Both the Horror and Steampunk/Victoriana lists had some games resting on genre conventions and repeated tropes. Superhero games have a greater mechanical focus. Frankly super-powers present a huge challenge to designers: balance, cost, variety, sub-systems. So more supers games seem to be about bringing new mechanics to the table. Their pitch lines boil down to buzzwords like cinematic, simple, rich. But they don't bring much else. When I first saw Modern Knights I assumed it offered some kind of fantasy/supers hybrid. 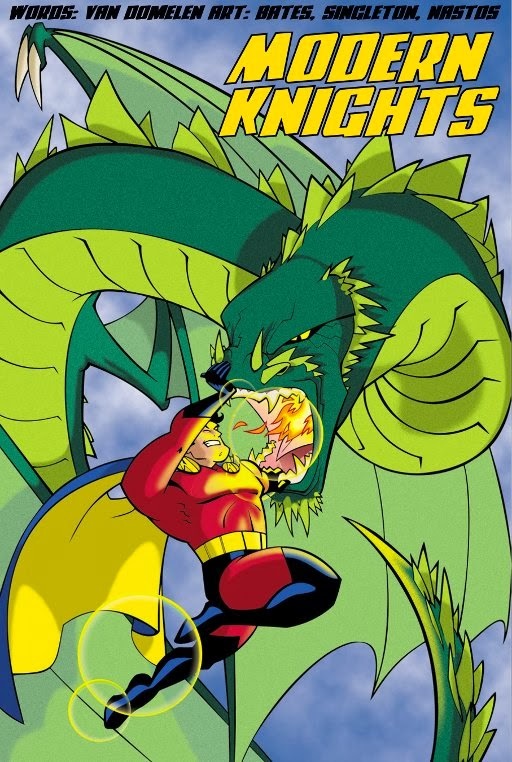 The cover has a superhero fighting a dragon on it. But the publisher blurb doesn't support that. Instead it offers another generic superworld- with "heroic ages" and "unique mechanics." I only found a couple of online reviews- most describing it as middle of the road. The company only released a single sample character for the game. It does have a G+ Page, last updated 4/12 as of this writing. Point-based. d10 Resolution. I'm better...I think… about being a gaming snob. Or maybe I'm just fooling myself. I didn't buying into d20 and so I skipped on M&M when it came out. Then someone calmly and politely told me why I should pick it up. I was running demos for the City of Heroes rpg at Origins. The Sunday morning session ended up with only two players. One took off and I spoke with the other about his experiences at the con and what he liked in superhero games. He talked about how much he enjoyed Mutants & Masterminds, how it echoed elements from other supers rpgs, and what new things it brought to the table. He didn't dismiss other systems. Instead he focused of what this game did that he liked: customizable powers without complexity, solid balance, fast combat, and a novel damage system that felt right for the genre. I wish I'd gotten that guy's name. He pointed me towards a system which I've loved running. More than that he showed me how to be a fan advocate - speak to strengths, don't fear making connections to other systems, cite distinctions, and don't attack other games. I tested M&M first with a group of novices. None of the players knew d20 or followed comics. They enjoyed it. The combats sped by and yet everyone contributed to the results. I ran a second campaign with a group of Champions-loving veterans. They enjoyed the game and liked the system, though they longed for the expertise they had with Hero System. They'd play it if I ran it. And I would. 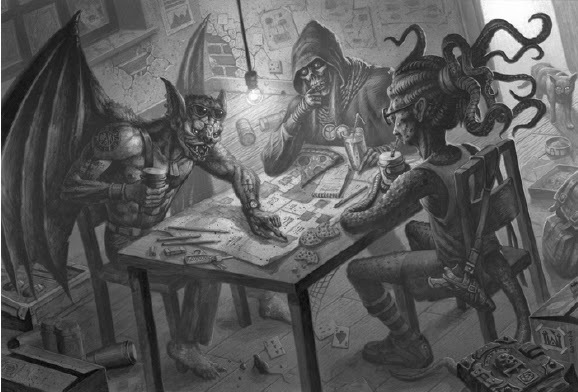 The mechanics made sense to me and within a few sessions I could improvise encounters and introduce new elements without stopping to check everything. The smart and clean organization of the book made it easy when I did have to hunt through. In short, M&M converted me quickly- and changed my tune on d20 adaptations. I bought all of the first party supplements for the game and many Superlink products including LPJ's various pdf books of archetypes and new powers. The changeover to second edition bothered me since I'd been happy with the original. Eventually I tried it out...but that comes later in this story. Point buy. d20 Resolution. I've consolidated Pulp games into a single entry. Each offers a dash of masked vigilante action in with their Pulpy goodness. Danger Quest (2002) My friend Art gave me this. The subtitle doesn't do justice to how bonkers it is: "Pulp Adventures in the 23rd Century. "Buck Rogers, right? Nope, instead you get a future world which contains all of the classic pulp tropes done as a simulation: G-Men, Zeppelins, Mad Scientists. Double mumbo-jumbo. Pulp Zombies (2003) The Pulp supplement for All Flesh Must Be Eaten. The game adds a few power elements- like gadgets, mentalism, danger sense. The deadworld "Zombies, Inc" centers on masked adventurers. Dime Heroes (2003) The 1PG system's take on pulp. It focuses on radio serial heroes like The Shadow. Pulp Adventure (First Edition) (2003) A very indie and homebrew take on pulp adventures. The author has put out a couple of supplements and at least two significant revisions. He successfully kickstarted a Pulp Adventure Companion in 2013. The third big supers launch of 2002. Our group ended up with copies when my late friend Barry Winston did art for the book. At the time SAS didn’t grab me. In fact I had little memory of it, beyond it having interesting supplements and a connection to BESM. Looking at it again, I'm amazed at the production values here. Guardians of Order's full-color version has great layout, clean art, and a ton of material. While the world background on offer is pretty conventional and unsurprising, the presentation's awesome. Everything looks good. So what turned me off? 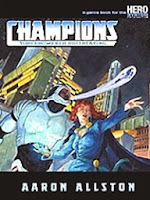 At the time I still liked Champions- despite the move to 5th edition. Silver Age Sentinels struck me as trying to do the same thing as Champions. If I wanted that level of granularity and asymmetrical powers, why not stick with with that? Without an advocate or a teacher in our group, SAS just withered. That's too bad as I've heard stories from a number of folks who liked the game. Some of the supplements, especially Criminal Intent, have more interesting concepts than the core book. On the other hand, GOO crashed and burned later with their problematic business dealings and screwing over freelancers. I did notice one detail when I re-examined the core book. SAS opens by answering the why this game will succeed while others have failed. It offers two reasons. The first is that previous superhero games had mechanics too closely tied to the world setting. I've reread this a couple of times and it still doesn't make much sense to me. A few games of the era do this- Underground, Aberrant, Cybergeneration. But in each case that's because they have a strong and specific setting rather than offering a general supers game. But the big two supers competitors- the elephants in the room- Champions and V&V don't. More supers games aim for generic over specific. SAS offers a second reason: it is heroic where others aren't. I think that's a fairer reading. SAS comes out after a series of games which embrace darker themes: Champions: New Millennium, Brave New World, Dark Champions. But by and large I'd say more superhero games up to this point emulate a Silver Age morality and mentality by default. I don't include it on the list, but in 2003 GOO released a d20 version: Silver Age Sentinels: The Ultimate d20 Superhero Role-Playing Game. Point-based. d6 Resolution. Like Deeds, Not Words, Vigilance offers a d20 supers game which sticks closely to the source mechanics. Superheroes have origins which function as races and classes which define some base abilities and feats (Detective, Gangster, Brick, Projector). It brings new feats and skills to the table, but the big addition is the power rules. These function like feats for the most part, a common approach for extras in various flavors of d20. The book includes its own world history and background but focuses on the new rules and options. 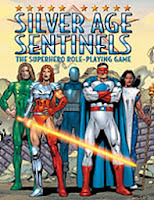 In 2003 Designer Charles Rice reworked this as Blood and Vigilance a superhero set which used d20 Modern as the basis rather than the standard d20 SRD. Both handle supers with origins and classes. Unlike the earlier version, B&V covers narrower range of superheroes. In this case those with innate powers like mutants, cybernetically enhanced, or accidents of science. About a third of the 72-page books given over to powers, a third to classes, and a third to gamemastering. Rice apparently only published one specific addition to the line: Blood & Vigilance: Mystic Arts. That's a small 16-page booklet. I suspect the other "Blood &..." books from RPGObjects could also be used. Class and level based. Various dice. A corner case supers rpg. I grew up loving TV’s Spider Man, the Super Friends, and the 1960's Marvel Cartoons. In my mind they had the same kinds of powers and duties as Atom Ant, Hong-Kong Phooey, or the Herculoids. Caroon Action Hour aims to emulate the shows of the 1980's including Turbo Teen, Thundercats, Silverhawks, MASK, and the Inhumanoids- all of which could be read as superhero stories. The system takes an open-ended approach to special abilities and powers. A simple four-step process allows players to define anything. It reminds me quite a bit of Big Eyes, Small Mouth but even easier to use. CAH feels complete. It has tons of advice for handling a wide variety of situations. It is rules light but not rules thin. Nearly half the original book’s given over to series pitches and campaign ideas. CAH did well enough to spawn two more editions: Cartoon Action Hour: Season Two and this year's Cartoon Action Hour: Season 3. It also has sourcebooks covering anime (Going Japanese), "not" Transformers (Metal Wars), and space (Star Warriors). Point buy. d12 resolution. Deep7's 1PG system offers a series of extremely rules-light games across many genres. Their foray into supers comes in at a whopping 13 pages. The cover has a retro Silver Age vibe to it. 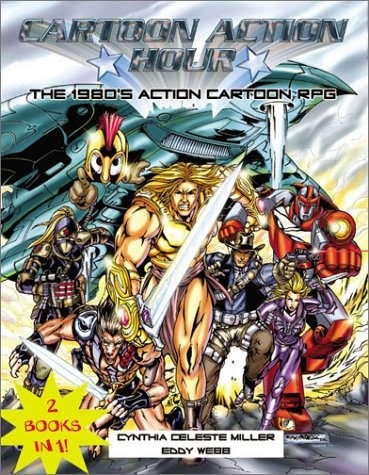 Unlike many games in this series, the company published an expansion- Hero Force: Giant Size Super Special- which presents almost thirty pages of additional material. Random and point-buy. 1d6 resolution. I’ve circled back to writing up MURG several times now. It is a strange beast. On the one hand, I admire the way it breaks the mold and aims for another play style. On the other, in doing so it embraces some things I hate at the table. 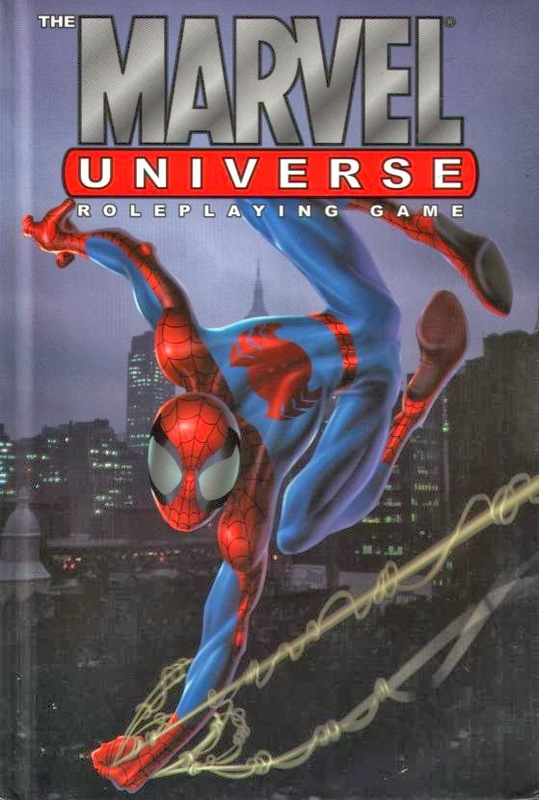 The Marvel Universe Roleplaying Game comes from Marvel Entertainment itself, not from a gaming company. I believe that’s a first for a licensed product. Of the three designers, only one has any rpg credits before or since. Daniel Seth Gelber’s listed as a contributor to a half-dozen Paranoia products from 1984 to 2009. MURG feels like a game designed by people with limited rpg experience or who deliberately avoided looking at other games. That’s not necessarily a bad thing. That can generate new forms and ideas. But it can also mean throwing away useful ideas and approaches. The Marvel Universe Roleplaying Game goes diceless. It isn’t the first supers game to do that; both previous Marvel games had some diceless elements. But MURG shifts the central game mechanic from randomization to resource management. Players track and control damage, effort, and abilities through tokens. They move these tokens around on their character sheet. Players have full control and information. They make decisions about costs and future actions. It that regard MURG feels like a board game. I’m intrigued by the concept, but as a rule I dislike that kind of tracking. Players have to keep their sheet on the table in front of them and move things around on it. That eats up table space and adds a whole layer of fiddly-ness. Games like Fireborn and Weapons of the Gods required players do this but with dice. I’m not a fan of that. Beyond that MURG also suffers from a dense rulebook. The rules themselves aren’t difficult but the organization and layout makes things harder than they have to be. Jake Baker’s smart review on RPGNet nails down one of the other problems. The designers want a simple system yet have the most insane modifier list I’ve seen. The Difficult/Resistance chart presents an impenetrable mess. Despite this the game did well as an rpg and delivered three supplements. But rpg sales don’t come close to matching comic sales and that pushed Marvel to shut down the line within a year. Point buy. No randomizer. 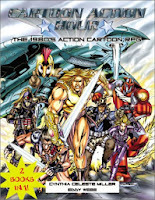 Simon Burley co-designed Golden Heroes in the 1980's. Games Workshop had originally intended it as the Marvel Supers game, but ended up losing the license to TSR. They only published the core rules and a couple of decent supplements before it vanished from the shelves. In 2003 Burley relaunched the game as Squadron UK. While not exactly Golden Heroes, it shares many elements. For several years he added several supplements to the line: Balance of Power, Hunters, Terror Firma, and more. However after ignoring Burley's inquiries about the IP and rights reversion for some time GW finally got back to him. They asked him to cease and desist. The rights had not reverted and his product remained too close to the original. Burley revised and re-released Squadron UK at the end of 2012. Random Generation. Various Dice. When I first saw this I simply assumed Team Frog had developed an anthropomorphic supers setting (ala Furry Pirates). But Supermegatopia is a complex and long running adult comic and webcomic. TV Tropes offers a decent overview of it here. The book's rather small for a setting with a rich history, coming in at only 51 pages. It uses the "Paradigm System" which powered the earlier game UNSanctioned (on my previous list). Most of the reviews and comments express disappointment at the wasted potential. Point buy. d10/d20 resolution.